To assist those in need, primarily focusing on veterans, service members and their families. The board is compromised of volunteers that are family and friends. Most have known Michael since he was a baby. On August 28, 2008, Spc Michael L Gonzalez was KIA in Bahgdad Iraq. The Gonzalez family was devastated. Many flowers, cards and gifts of condolence came to the Gonzalez home. 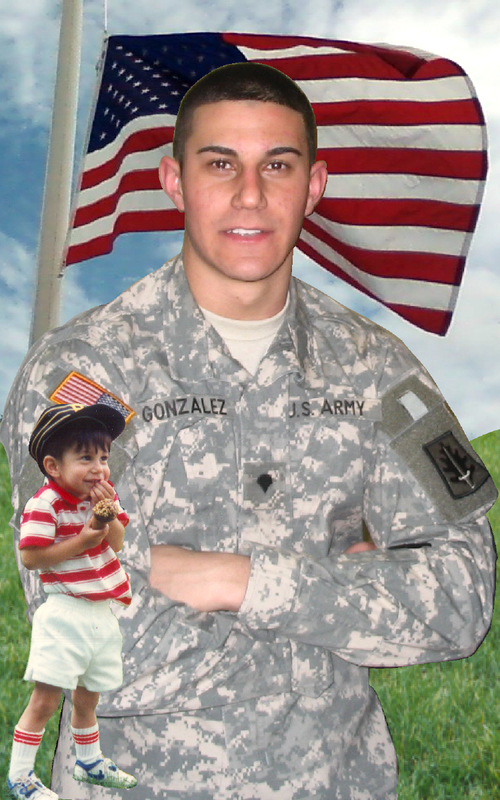 On a wing and a prayer Ida Gonzalez said to Pedro Gonzalez “We should start our own non-profit.” His response was “Who will donate to us?” Ida’s answer, “God will provide.” Butterfly Circle of Friends was founded on October 8, 2008 in memory of Spc Michael L Gonzalez. We believed that Michael was in Iraq to make a difference in the lives of Iraq citizens and we wanted to continue to make a difference to keep his memory and legacy alive. We are a small non-profit organization without any administration cost. The funds we have raised in 8 ½ years of existence we have assisted 1,000’s, by providing coloring books to children effected by Hurricane Sandy, holiday gifts to military families in need, donating of funds to other organizations that provide services to veterans, Bring Them Home to Homes a housing project for veterans in Highland Park, NJ, Spring Reins of Life and Vet, Chat, and Chew. The butterfly comes from the funeral home were Michael’s viewing was. The funeral home incorporates butterflies in their decor. A butterfly reminds us that out of darkness, beauty emerges. Circle of Friends was derived from the friends who surrounded the Gonzalez family with their love and support in time of sadness. Our very first fundraiser was the dinner dance Michael loved to dance. Originally started in January and now is moved to spring because of weather (snow). In 2012 we started a 5K in the fall to raise funds specifically for military, veterans and organizations that provide services for them.